Print out the letters as 4 x 6 size and then matte & frame them. Carla did this project and gave to her friend as a gift. It was a huge hit! Spell out any first or last name or word. Follow this tutorial by Donna at Funky Junk Interiors and make your own gift tag. Print out the letter images and attached to cardstock paper. Then attach to a ribbon and you've got a home-made banner! Wendy at Artsy Chaos made this IMAGINE banner. Cute DIY holiday valance. Find out how to create it HERE . Choose a matte - either one of Artistic Letters mattes or one at craft or hobby stores, and spell out a last name. A sure winner for a birthday or wedding gift - or for yourself! Cindy created a vintage Hawaiian look for her "Mahalo" (thank you) cards. Great for yourself ... great as gifts too. Amanda from "Crafts by Amanda" designed this amazing gift for a graduating senior. CLICK HERE for a tutorial on making this project. 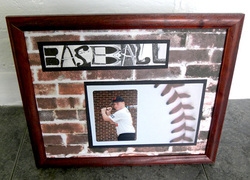 A great way to customize pre-matted, individually slotted frames. Just use ArtisticLetters alphabet photograph images. Flora spelled out GUSTAFSON with her own images and made this great montage. Love it - thanks for the image Flora! Erin decided to "recycle" some frames she had around the house to give her last name an eclectic shabby-chic look. Always remember when your child's team wins the championship. Marissa and her husband have used the word "Random" as one of their .. well, random words to each other. She framed it and was her birthday present to him. Create truly unique cards for all occasions. Personalize them to add a unique individualized flair. Great for Birthdays, Thank You, Anniversary, and any other type of card you want to send. Looking for something totally unique when it comes to spelling names, places, and expressions? Add a whole new spin with these letter photos to your designs. Create the gift that the happy couple will remember forever. Create your own unique baby announcements and then make a matching print like this one in either 8 x 10 inch or 16 x 20 to frame for the baby's room. You can make this amazing project with your home printer! CLICK HERE for a step by step tutorial courtesy of Taylor at MaryJanes & Galoshes. Leslie printed 4 x 6 prints in sepia tone and then used clip frames to spell out her dog's name. Fanny in NYC used images "F" and "M" to design her own personalized artwork for her bedroom. Great idea Fanny - thanks for the photo! Julie printed out the letters and used the old reliable "Mod Podge" to adhere them to wooden blocks. CLICK HERE for a tutorial to make this! Rita, of CoffeeShop Rita fame personalized this image of her puppy son with ArtisticLetters images. Love it - thanks for the photo! Stand-alone 4 x 6 clip frames are an inexpensive way to display the letters. Even hang each frame on the wall to spell words horizontally or vertically. Linette printed out 2 different Artistic Letters Mattes ("baseball" and "grungy bricks" and make this awesome framed collage of her son. 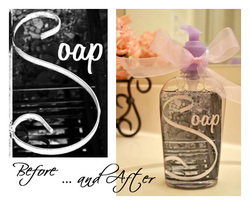 Laura also created this cute soap dispenser from the letter S and then typed the rest of the word "soap." Transferred it to a dispenser. Dorry Lyn made another project using some of her own digital scrapbooking elements. She printed and framed it. 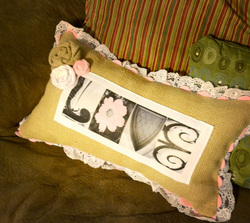 Laura printed out her LOVE design on Iron On transfer paper and got busy with her sewing machine. Very clever - thanks for the photo Laura! Flora used one of the letter "T"s to make a "plus" sign. Customize the birth with the first name, date of birth, weight & length. Jenna of momsbalancingact.com used a mix of ArtisticLetters alphabet photography images and her own pictures of her kids for this LOVE-ly project. Connie was amazingly creative and made this bracelet out of a letter "D."
Create your own announcements and digital montages. Valerie create this lovely design for her friend Simone. She incorporated the meaning of the name into her creation. Great idea! Kimberley created this awesome print about FAITH, and then framed it. Looks great! These are just a few ideas to get your creativity going. :-) Now it's time for you to create your own projects!